Whether you ski or snowboard, your goggles are one of the most important pieces of equipment for your day at the mountain. Your goggles protect your eyes, allow you to see better in poor visibility, and take a lot of abuse. Plus, they're often very expensive. So it makes sense to take care of your goggles, so they can take care of you! Here's how to care and clean your goggles. How many times have you seen this? Goggles hanging in the rear view mirror of someones car. Some of you may be thinking, "I keep my goggles like that." 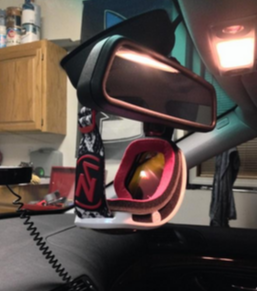 While the "rear view mirror goggle hang" might look cool, and let everyone know how much you love to hit mountain, it's ruining your goggles! When ski and snowboard goggles hang from rear view mirrors it allows UV rays to shine through, and heat up the inner side of your lens! This can cause lens blur, lens warping, the breakdown of anti-fog coating, and can cloud the lens making your goggles difficult to see out of! 1. The inside of your lens has an anti-fog/UV coating to prevent fogging, and prevent sun and reflection damage to your eyes. 2. The bag or cloth your goggles came with can be used to clean your goggles. It's not the best thing, but it will work. 3. Do not EVER try cleaning your goggles with snow. Snow is gritty, whether it's the ice crystals that make up the snow, or whatever natural grit has mixed with the snow. Cleaning your lens with snow will end in scratches. 4. If you can remove the lens, do it! It makes cleaning your lens and goggles much easier! If possible, remove the lens from the goggles. Wet the microfiber cloth, not soaked, but moist. Then gently blot the lens with the microfiber cloth. Do not wipe, this can cause scratches. Once the lens is wet, holding on to the edges of the lens shake the lens dry to remove the majority of water. Then take the dry portion of cloth and blot away the rest of the water, and once the lens is clean set it aside allowing it to air dry. Take this time to wipe down the goggle frame. You can use the same wet microfiber cloth to clean your frames. Be sure to check that the vents are not clogged. Once both lens and frame are dry put the lens back into the frame, insert the goggles into the protective bag or case they came with and keep them somewhere warm and dry.